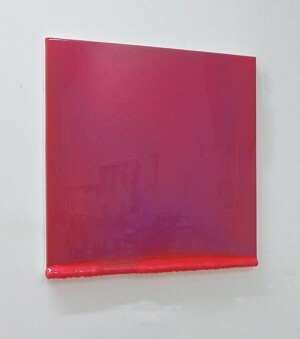 NEW YORK, Dec 7, 2011/ — Pushing Paint is pleased to announce the exhibition Cathy Choi: Recent Paintings. Presenting four large scale and five medium-scale works, the paintings will be on view weekends, 12-6pm and by appointment December 10th–December 31st. Cathy Choi: Recent Paintings is the culmination of a decade long study depicting the elusive, prismatic qualities of water. In this latest series, Choi employs a combination of liquid resin, hot-glue forms, and oil paint capturing an otherworldly topography of electric color and physical depth symbolic of her personal views on nature. Splashed, dripped, poured and brushed resin expands across her canvas in fiery magentas and bright yellows, cold blues and icy aqua. The final products are vibrating, high-gloss non-figurative abstractions; studies of organic form filtered through a process and vision that is both controlled and erratic, familiar and alien. Cathy Choi born in Seoul, South Korea received her Master of Fine Arts from American University in Perugia, Italy. She has exhibited locally and internationally, and currently lives and works in Brooklyn, NY.